The La Plage Resort with its in-house “Fusion” restaurant in Taormina is able to offer guests a gastronomic experience that it both original and innovative. This is thanks to our chef who has invented a completely novel way of combining different flavours from the typical Mediterranean cuisine together with the complexities of traditional Sicilian cooking. This becomes an effectively unique explosion of flavours, the like of which, guests are unlikely to have experienced before and which provides a chance to sample a cuisine that is both satisfying and tantalizing at the same time. An individual philosophy, great technique and creativity are important contributory factors but, perhaps most important of all is the careful attention paid to the choice of ingredients which are selected in accordance with the seasons in order to ensure a perfect final result from every view point. The dishes served at the “Fusion” are truly innovative because one of the restaurant’s aims has been to transform traditional street food into haute cuisine, thus bringing to the table the true essence of this whole region of Italy. Aromas, tastes, colours and local produce come together in our dishes in a blaze of flavours, shapes and colours. 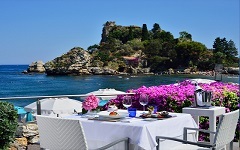 But, the Hotel La Plage in Taormina, due to its special and strategic location, can also provide the restaurant’s guests with an opportunity to lunch or dine in a setting with a unique and enchanting atmosphere. The terrace with the sea right below it and breath-taking views of Isola Bella is the perfect setting for a romantic dinner, a smart working lunch or any other type of event the hosts wish to ensure their guests will never forget.